The main aim of this policy has always been the improvement of business competitiveness, using clusters as a tool and never as an end in themselves. During these 25 years of experience, cluster policy has evolved in terms of the definition of the initiatives, from a narrow definition of a business and around a traditional value chain to a more cross-cutting approach where an initiative can also be defined based upon a strategy or a given end market. At the same time, the geographical scope has enlarged since at the beginning initiatives had a more local focus and nowadays it covers more territory, to reflect the current reality and reach a higher critical mass. Moreover, during these years, Catalan cluster policy has gradually promoted the institutionalisation and professionalization of the cluster organisations. Notwithstanding the changes, there are some methodological elements that have remained constant throughout the years: our philosophy of public-private partnership, where the initiatives have been frequently initially launched by the public administration but have developed where there has been a private leadership. And the combination of analysis and process tools, that is diagnosis of the competitive position of the cluster coupled with the implementation of actions focused on strategic change as the driver to improve competitiveness. All these features have favoured the blooming of a cluster hotspot in Catalonia, not only involving cluster organisations and public authorities but also including specialised organisations related to clusters like TCI, the European Foundation for Cluster Excellence or consultancy firms and business schools with specific programmes. 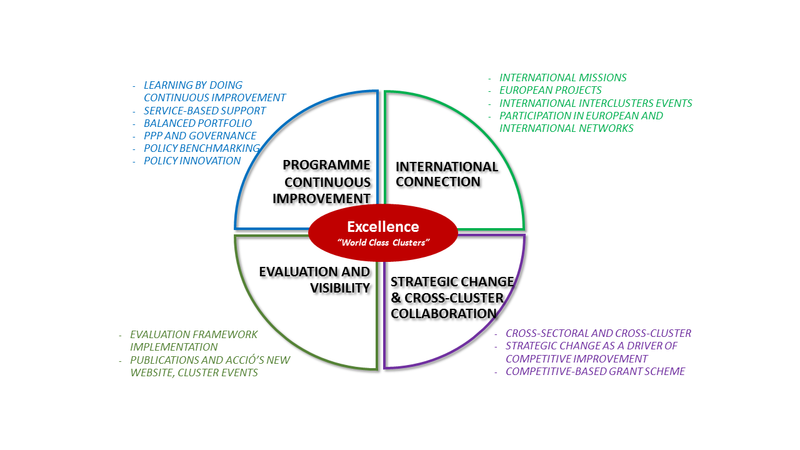 In 2013 the Catalonia Clusters’ Programme was conceived to provide a structured framework to the cluster work undertaken in the region and promote excellent cluster organisations. The programme, open and voluntary, is designed for a three-year lifespan after which it is thoroughly revised. In order for a cluster to become member of the programme, it needs to be aligned with the Catalan cluster policy and meet ten criteria related to the scope and critical mass as well as to governance and professionalization of the cluster organisation. Currently there are 29 clusters part of the programme which in turn are aligned with the Catalan RIS3 priorities as can be seen in the figure below.